Renault has announced changes to the electric Zoe line-up for 2019, with the Z.E. 40 long-range battery now standard across the range. The entry-level trim for the Zoe, ‘Expression R90’ gives customers all of the key features needed in an EV, including the 22kW Chameleon charger and standard R-Link navigation with seven inch touch screen. The Expression also offers heat pump climate control as standard. The new, more powerful R110 motor is available on both ‘Dynamique Nav’ and ‘Signature Nav’ versions of the Zoe. The Dynamique Nav version also offers rear parking sensors, hands-free key card entry as well as the added benefit of automatic lights and wipers, while Signature Nav trim includes leather seats, parking camera and Bose audio as standard. Dynamique Nav and Signature Nav trim levels are also available with the Q90 motor. At fast AC charging points (43kW ), Q90 versions charge almost twice as fast as the Zoe versions with the standard motor. 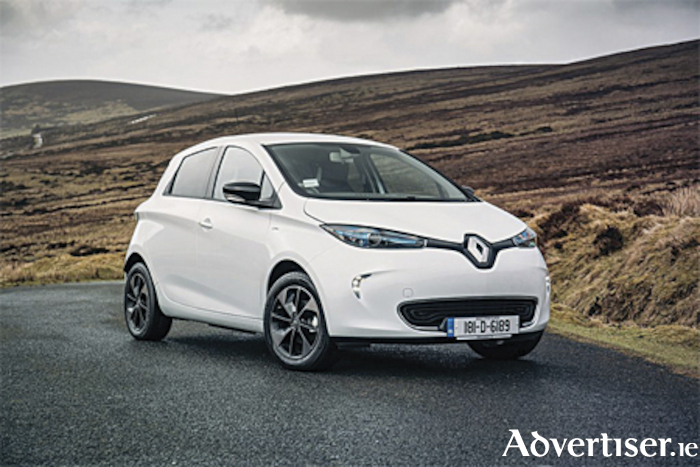 The Renault Zoe pricing starts from €24,990 after VRT relief and SEAI grant, including full battery purchase. The Zoe is available with zero per cent finance through Renault Bank, and available for a 24-hour test drive in all 26 Renault dealerships across the country. Companies buying both the Zoe and the Kangoo can avail of accelerated capital allowances, enabling them to write down the value of their vehicles in a single year, while employees can benefit from zero per cent BIK. Launched in 2018, the Kangoo Z.E. 33 quickly became Ireland’s best-selling electric van, priced from €28,190 after the SEAI grant of €3,800 for businesses. The van’s 7kW AC charger can take its 33kWh battery to a full charge in just six hours, with the ability to ‘top-up’ the vehicle by up to 33km in just one hour, according to Renault. Renault also offers Renault Mobility, an in-house, app-controlled car-sharing solution which simplifies the management of pool cars. Unlike a petrol or diesel pool car, a Renault Mobility Zoe pool car allows employees overnight use with no tax implications thanks to the zero per cent BIK rating. Renault says that it aims to demonstrate its commitment to electric vehicles by appointing a dedicated Z.E. Champion in each of its Irish dealerships, an electric vehicle expert who will be on hand to answer all customer queries about EVs using real-life experience. Renault has also introduced Z.E. Pass which operates in several European countries, including Ireland, allowing customers to charge their EVs on a wide variety of networks, using a single account via a smartphone app.